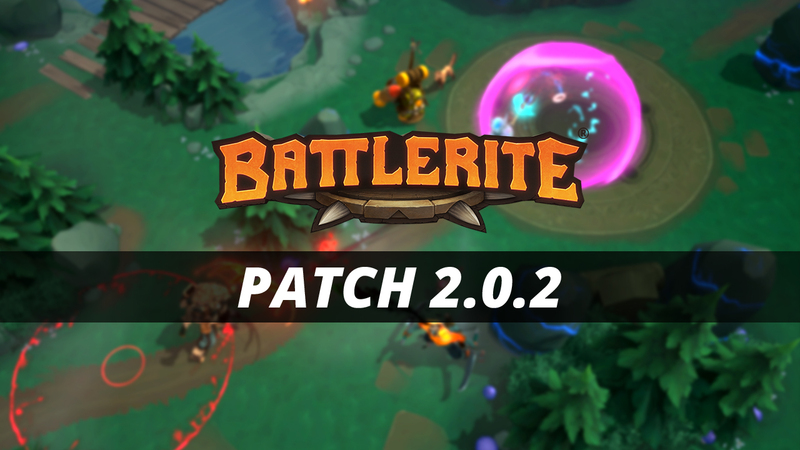 Battlerite Arena Patch 2.0.2 is scheduled to go live on Wednesday, March 27th at 8:00 UTC. Downtime is scheduled to last up to one hour. A notification will now be displayed on login when action has been taken against a player that you have recently reported for misconduct! This notification will appear once when you log in if applicable, so y’all good fellas reporting naughty gremlins will not be spammed with notifications. Daily quest notifications should now properly trigger upon login. Fixed an issue where achievements related to Champion Levels did not progress correctly. Cooldowns now all reset correctly at the start of the round. So many Explosive Barrels were detonated in the Arena that we ran out of barrels for the foreseeable future. If new dynamic map objects return, we intend to release them on maps they are designed for. Explosive Barrels removed from Blackstone Arena (Day & Night) and Meriko Summit (Day & Night). We’ve continued to refine the Armory and shape it in the direction that fits Arena best. Elements that contributed to a chaotic feel have been removed, and many items have been changed. Explosive Barrels have run out for Armory as well. No longer increases health and energy received from Health and Energy shards. No longer increases healing received by 10%. Allies receive 50% of the benefit you do when you pick up Health or Energy shards. Any excess healing you receive is transferred to your nearest ally. Overload was released in a big, splashy experimental state to ensure that it made an impact on Arena rounds. Overload was designed to increase skillful play on both sides in situations where one team is down a player, rather than allowing the game to get into a stale state. In certain situations, Overload is perfect for remedying this problem. In other situations, Overload is overly effective and puts too much emphasis on the game state after a player has died. We want to scale this back to make sure that the portion of the game before a player dies is always vital in all matches. While we’re adjusting Overload now, we’re simultaneously looking into other combinations of methods to address those stale game situations. If Overload can’t be adjusted to a less polarizing state, then it’s on the table to disable Overload in Arena until we can re-evaluate this kind of mechanic. We’ll also be adding the option to toggle Overload in Private Lobbies in the near future. Bulwark (Q) has been made consistent with other directional shield abilities in the game. You can use escape or mobility skills while Bulwark is active, but you will not be able to use regular abilities unless you cancel cast first. Like Bakko’s Bulwark, Ulric’s Radiant Shield has been made consistent with other directional shield abilities in the game. You can use escape or mobility skills while Radiant Shield is active, but you will not be able to use regular abilities unless you first cancel cast.